Why you need the best web host? Every company these days needs a website. Every freelancer needs a website – if they are serious about their business. And even private persons should have websites. Just because they are fun to have. Creating a website is extremely straightforward – it only needs 2 simple steps. And it is the basis for any of these 10 completely free marketing strategies for startups and SMEs. To host a website, you need a web host. And since there are a myriad of web hosts out there these days, finding the finest can prove to be quite challenging. 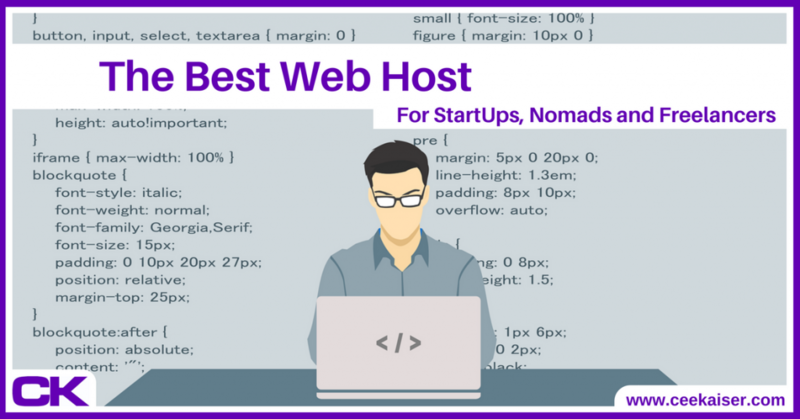 Hence I have looked into a bunch of companies to find you the best web host for startups, digital nomads and freelancers. In case you do want to make money online, or are already generating location independent income with a website, make sure you have the best web host supporting you. 1 What Is A Web Host? 2 What Is A Hosting Plan? A web host, or web hosting service provider, is a business that provides the technologies and services needed for [your] website or webpage to be viewed in the Internet. Basically, you buy a hosting plan from a web host to use their computer infrastructure same as you have a contract with your phone company to use their network. And, same as your phone loves a good telecommunication company, your website will love being hosted by the world’s best web host. A hosting plan is data space you rent from another company (your web host). On this space, you can save all the data that you want your website to contain, like texts, images, videos and similar. The hosting plan you choose determines how much data you can store, how secure the connection is, how reliable the connection is etc. The space where your data is hosted is called a ‘server’, and could be located anywhere on the planet. Thanks to internet connections other people can access whatever server data you make public by typing your domain address into their web browser. Sounds complicated, and behind the scenes it is, but for now all you need to understand is: Your website data is securely stored on your web host’s server. Thanks to your perfect domain name people can access this data and see what you want to present to the world. And even simpler: You do need a hosting plan to build a website. No hosting = no website. Don’t worry. It will all make sense at some point. Note: In case you have heard of free hosting before: Yes, it exists. You can for example open a blog on wordpress.com or blogger.com. However, these are very limited in their flexibility and restricted with their money-making potential. None of the best web hosts is free. If you want to showcase your startup properly or even earn money with your website, free hosts are not for you. The main requirements for a good web host are straightforward. The host needs to be fast, reliable and affordable. The best web host should offer quick and excellent customer service to answer your questions and assist with any needs. A good web host ensures that your website is visible online without interruption (pros call this ‘Uptime’). No different than you’d expect your phone company to have phone reception as constantly as possible. Luckily, most web hosts are quite reliable these days. Secondly, you want your web host to deliver exceptional and super quick customer service in case anything goes wrong or you have questions. Trust me when I say good customer service is invaluable. You will need them sooner or later. Their pricing is absolutely fair. Their basic package starts at 3,95 USD a month. Not the cheapest on the market, but very well worth the money. As probably you are aware, as marketing consultant specialized in startups I generally source the best value for money. I can recommend email marketing systems that are completely free of charge, but they still offer good service and deliver your emails, which is paramount. No point in having a free newsletter system if it doesn’t deliver your emails. And no point in having the cheapest web hosting service if your site is offline at all times, or customer service can’t assist if you have a problem. If you want to impress with your website, get it right. 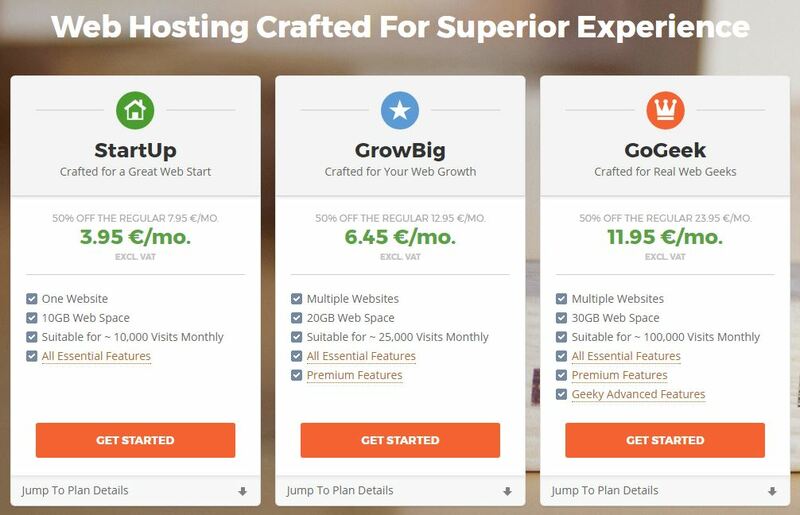 The best startups rely on the best web host. If you don’t want to impress with your website – don’t create one. In addition to fantastic uptime, SiteGround hosts your website on solid state drives (SSD). These are a hell of a lot faster than standard hard drives (which most other web hosts use, since they are cheaper). We are taking about milliseconds here, which might not seem to matter much at first. But it does matter to a company called Google, so it should matter to you. Google does calculate your website loading speed into their rankings – the quicker, the better. To keep your site as fast as possible, SiteGround has also developed several in-house programs to speed up your WordPress site. These tools include a special cache system and extra security layers (blocking out spam and hackers results in a faster site for website visitors). 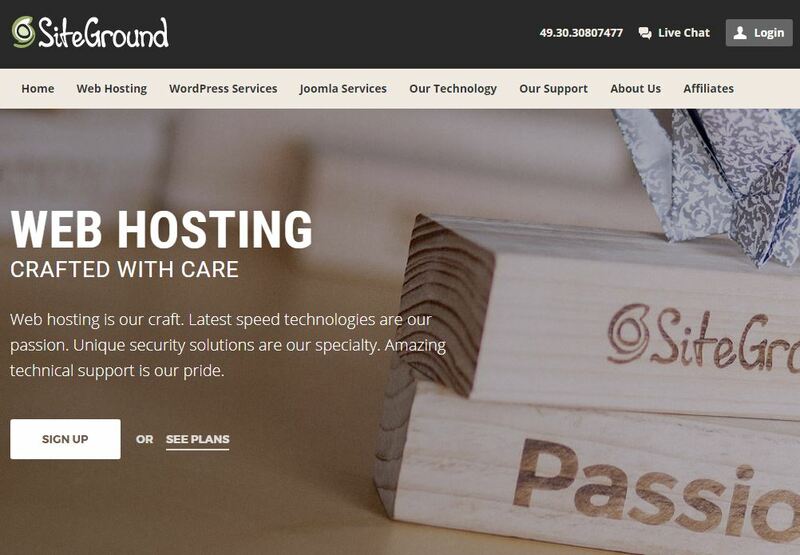 There are many reasons why I call SiteGround the best web host. But besides anything mentioned above, the biggest winner for SiteGround is their customer service. I have worked with lots of IT companies, and the most annoying experience is if things don’t work as they should, and you have nobody to call for help. When it comes to customer service, SiteGround beats the entire competition, hands down. It is actually the main reason why loads of location independent website owners rely on SiteGround. And why I moved from FatCow to SiteGround in 2016. FatCow did offer excellent customer service as well, until they got bought by EIG. EIG is well-known to skimp on every corner of the business to maximize profits. They seemingly relayed half of the customer support team at FatCow! Waiting times in the chat went from a minute up to 45, which I judge absolutely unacceptable. As for SiteGround: Visit their website. Click on the Live Chat button in the right hand top corner. Count the seconds until you have a real human being talking to you. Ask any question you feel like asking. And be amazed by how quick, friendly and knowledgeable they will get back to you. The beauty is: Their customer support doesn’t end after you purchase a hosting package. This team transfers your entire website from your old host to SiteGround (if you have one already). They help you install WordPress. And they backup your site daily and assist with any question you may have, 24/7 – all included in your hosting package! Noble Note: Only one website migration is included, further websites cost around 25 USD per site. I have worked with numerous web hosts, including BlueHost (upscaling issues), FatCow (slow and incompetent customer support – since mid-2016), GoDaddy (email problems) and others. But since I switched to SiteGround in late 2016 I feel happy and well-taken care of. Best proof: You have found and can see my site. Noble Note: Same as I was excited about FatCow until mid-2016, things may change with SiteGround as well. I will of course keep this article up to date, and cordially invite you to sign up for my Thursday Thoughts below to receive the latest news. Or send me a message, so we can discuss the latest developments in the web hosting sphere. Do you have any further suggestions for web hosts that are suitable for startups? Who do you think is the best web host? Please drop a quick note (including your why) in the comments below.